Paper Tiger Filing System software is an indexing system for your physical files that has a powerful and easy-to-use search engine built into the database so that lost information is virtually eliminated in your office. You would simply type the information into the database relating to your physical files. Keep your paper in its original form (you do not have to scan it) and use the power of the computer to quickly and easily find the information when you need it. This is the best of both worlds. You get all of the best things from the computer, but do not have the problems of using a scanner, such as removing paper clips, staples or sticky notes or the problem with paper jams in the scanner. Paper Tiger can index anything; it’s not just document management! Some things just can’t be scanned, i.e., passports, contracts, binders, books, CDs, DVDs, etc. That cannot be done with systems that require scanning into an electronic file. So for paper filing, you would first set up all hanging file folders in your file cabinets at one time using the numbered tabs that you print out from the software and they never change. 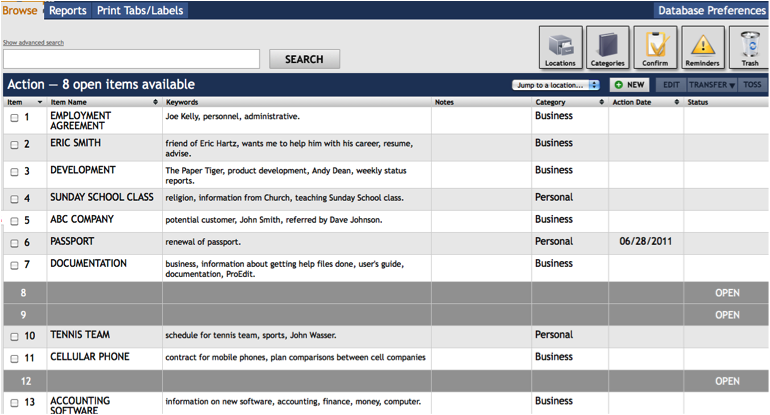 You input information relating to each document in the database’s digital file location. Paper Tiger assigns the file number to the document or set of relating documents that you want to put in the same hanging file folder. You can give the document any name you want without any worry about finding it later. This is because the system will allow you to tag keywords that describe all documents that you put in your hanging file folders. For documents that you want to add to the same file, simply edit the Item and add additional keywords necessary for the new document(s). Because the hanging file folders are already setup and waiting for your information, you eliminate the time-consuming hassle of having to find and create a file folder and tab each time you want to file something. Again, the software will assign an index number to each file you add to be put in the first available empty hanging folder. When you’ve converted your filing system to Paper Tiger, and you need to find a file later, you simply conduct a Google-like search in the database for whatever keyword you’re thinking on that day to find where your file is located. Please view our videos on our Why Paper Tiger page at http://www.thepapertiger.com/tour, which may help you understand better. You might find A Guide to Converting to Paper Tiger helpful. If you already have your files in place, we suggest start sorting the piles on your desk, then one drawer at a time. Purge (recycle) what you can. To give you an example of how you might set up a filing system, below are some suggestions. Please note these are only suggestions because everyone does not think, file or organize in the same way. If you need one-on-one professional help to get organized, we refer you to professional organizers that also specialize in implementing Paper Tiger. See our Paper Tiger Experts page. You would contract them based on their current ‘office miracle special, and they will be able to either come into your office or conduct a session or day with you virtually. 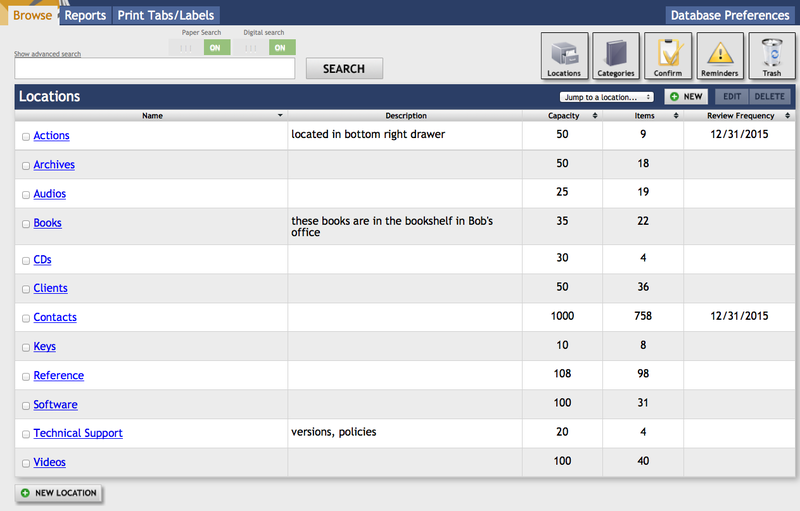 In Paper Tiger’s database, a Location is a physical Location for storing Folders, such as a file cabinet or a desk drawer that relates to a Location within Paper Tiger. So Paper Tiger uses Locations in the database to represent these places where you store the items you want to be able to find later. These Locations can be named anything you want – however you relate to what you are indexing, i.e., Action files, Reference files, Office files, Home files, House, Basement, Garage, etc. An example is shown below. Temporary Action Files are files of current projects or events that will come to an end, i.e., contracts under review, files on a new committee assignment or presentation notes for an upcoming meeting. Permanent Action Files are files for tasks that require ongoing action, i.e., “Call,” “Pay,” and “Write.” Another example of a Permanent Action File might be “Invoices to be Paid”. Once the invoice has been paid, you would move the document to the Reference Location in the Invoices hanging folder. A ‘Tickler File System” could also be considered a permanent action file. Click here to see more information regarding Action files. There is also an Action Date function within Paper Tiger in which you can select the next date that an item requires action. You can also note what action should take place on that action date. When you open Paper Tiger, a reminder will pop up for those actionable items. 6. Insurance (within this hanging folder, you might have manilla folders filed alphabetically for Autos, House, and Office) The Item name would be Insurance and keywords might be ‘automobiles, cars, Ford, Honda, State Farm, name, address and phone number of agent(s), policy, home, office, equipment, health, employee, employers, personal, workers compensation, … You could also sub-divide this to Insurance-Auto, Insurance-Home, Insurance-Office into 3 separate hanging folders. 13. Personnel/Human Resources (within this hanging folder, you might have manilla folders for each person in your company filed alphabetically) However, if the documents for each employee is greater than what will fit into a manilla folder, you might create a Location separately for Personnel/Human Resources. This would give you the option of creating a separate hanging folder for each employee. As you see these are not in alphabetical order, and of course, they do not need to be since we are indexing our files with Paper Tiger, however you might want to think about what types of files that you want to put together. For example, the files that you will be referencing more frequently in the first 1 or 2 file cabinet drawers convenient to you. The list above would be indexed Reference 1, Reference 2, Reference 3, Reference 4, Reference 5, etc. through Reference 14. The next file that you add to Paper Tiger then would be assigned Reference 15 and would go into Reference 15 hanging file folder. You might also have an Archives Location for the older files that you need to keep for legal or tax or various other reasons for longer periods of time, but do not need to reference. See our blog posts for Records Retention Guidelines. You would be able to transfer these files in the database from one Location to the Archives Location so that you can still keep track of where they are. Then move the physical files to the physical location to coincide with the indexed file item number in your Paper Tiger database. As information, when you transfer files from one Location to another, this opens the Item Number from the original Location for new documents. When a hanging file has gotten too overstuffed, you can sub-divide that file chronologically by year. For example, your hanging file folder Reference 12 for Community Service for 2009 and 2010 could be moved to new hanging file folders with Item Names ‘Community Service-2009′ and ‘Community Service-2010′. If you move them within your Reference Location, they would be added to the first 2 available open Item numbers in Paper Tiger. Or you could transfer them to your Archives cabinet. Reference 12 would then have room for your new current year community service information. For the above example, assuming that Reference Item numbers 1-4 all relate to information that you need for your taxes, you would be able to transfer those files to an Archive hanging file folder (or drawer or box depending on the amount of documentation you have and where you will be moving those documents to) named ‘Taxes-2010′ after you have completed your 2010 taxes. Reference Item numbers 1-4 would then be available for your new current year documents relating to the respective Item Names. Categories in Paper Tiger is an additional section in which you can use to classify groups of related items. The Category, “Bills” might be added to “Utility bills”, “Car repair bills” e.t.c. Don’t forget to create a records retention policy for your home and/or office to have a guideline of how long you should keep records in your specific situation. We have articles under our blog category, “Retention Guidelines: How long should you keep records?” that you might find helpful. Thanks Ramona, We truly try to publish helpful information to help people get organized to be able to find anything they need at the time they need it … in seconds! I used paper tiger several years ago and it was great. can you tell me if you now have a version for Mac? Our desktop, downloadable version of Paper Tiger is a Windows only software so if you wanted a version that wasn’t web-based, you would need to install Paper Tiger desktop onto a virtual Windows program for the Mac such as Parallels.